Dr. Ford typically has flexible openings in his schedule to assist with field work. Please call 360-271-7000 or e-mail vet@avian-vet.com to discuss your project needs. In most cases, a written estimate can be provided within 24 hours. When I come to your project, I bring everything I need for surgery and medical care. This includes sedatives for field use, anesthesia, and surgical instruments and supplies. If you provide transmitters in advance, I can prepare them for you too. I anesthetize using isoflurane gas in oxygen. In very remote locations I can use propofol injectable anesthesia if necessary. My protocols have been reviewed by an ACUC and should be compatible with your institutional policies. In typical projects, you will only need to apply the transmitters (if this is an implantation project), location (with protection from rain and dust), a surface to work on (table), clean water, and crates for recovering the birds. If travel and overnight stays are required, this also needs to be provided or compensated. 2016: Sage grouse in northern Nevada: In September, 2016, I went to northern Nevada to assist biologists in the capture of sage grouse. The goal of the project is to improve genetic diversity of specific populations of sage grouse in Washington state. I was just a small part of the action, helping to capture birds, check their health and make them comfortable for the trip, and take samples required for importation to Washington state. I had a great time working with biologists and volunteers. The location was beautiful, even in the dark, which is the best time to capture the birds. The clear, dry air and distance from light pollution, meant that the sky was packed with crystal clear stars and silence. Check out the photos posted on the Facebook page and Twitter feeds. You can learn more about the whole project on the WDFW website. 2016: Pacific loons in Y-K Delta and North Slope: 20 Pacific loons were implanted with satellite transmitters in June. Joel Schmutz was the PI with Brian Uher-Koch leading the field efforts. There were several contributors including the Smithsonian's Migratory Bird Center who is also making the tracking information publicly accessible HERE. 2016: Long-tailed ducks on Lake Michigan: 2 long-tailed ducks were implanted with satellite transmitters. It was hoped to do more but weather and early migration of birds out of the area hampered our efforts. Biologist Luke Fara headed the work with assistance from the USGS in LaCrosse, WI. 2015: Common loon in Central MN: With USGS biologists and volunteers, we captured 7 juvenile common loons and implanted satellite transmitters. All are still transmitting as of December, 2015, and most have moved to the Gulf of Mexico. 2015: Black scoter in Nelson Lagoon, AK: I accompanied USFW and ADFG biologists to Nelson Lagoon, AK. The weather was persistently horrible and so we were barely able to get out and attempt captures. We did succeed in implanting one female black scoter and she and her transmitter survived an entire north and south migration so far (29-Dec-2015). Her movements suggest that she nested also. 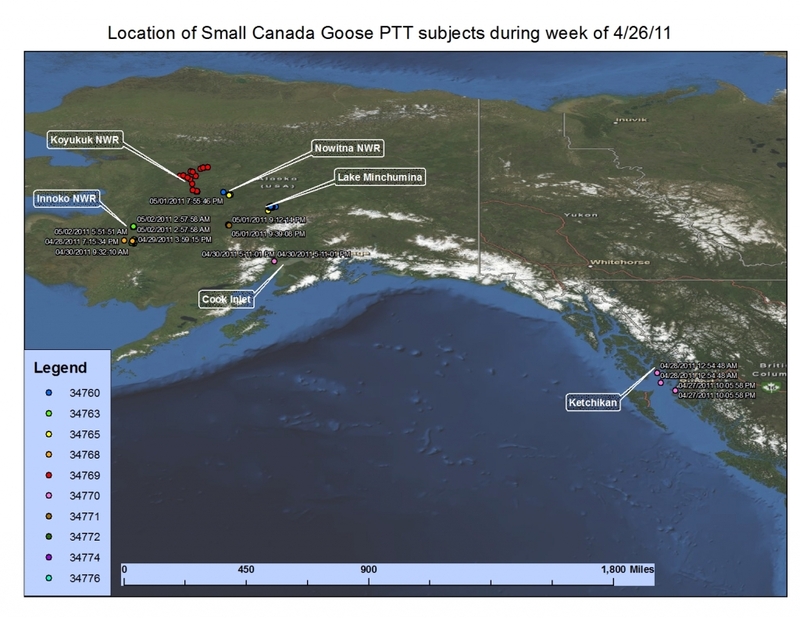 2014: Canada geese in Kodiak Islands, AK: I accompanied USGS and Alaska Dept of Fish and Game biologists in capturing nesting Canada geese for satellite transmitter implants. This was very remote work in a beautiful setting. 2013: Yellow-billed loons in the Canadian Arctic: I accompanied biologists from Alaska and Canada in capturing and implanting satellite transmitters in 14 nesting yellow-billed loons. 2012-15: Winter Waterbird Study on East Coast: This involved implanting over 150 satellite transmitters in red-throated loons, surf scoter s, and northern gannets in NC, MD, WV, DE, and NJ. 2012: Capture and Sampling of Bald Eagles, Ravens, and Turkey Vultures in Coastal Washington and Oregon: Dr. Ford assisted raptor biologist Dr. Dan Varland (Coastal Raptors) and other biologists from Hamer Environmental with a project focusing on avian scavengers of coastal Washington and Oregon. The project was awarded a healthy starting grant from the US Fish and Wildlife Service. We are currently (2016) preparing to publish our findings. MORE HERE! October, 2011: WDFW Contract Awarded for Goose Satellite Transmitter Implants: I was awarded a contract to assist Washington State Department of Fish and Wildlife to implant satellite transmitters in lesser Canada goose species throughout Washington. The transmitters allows WDFW scientists, such as Mikal Moore, project coordinator, to follow the birds through their migrations and identify their breeding and wintering grounds. You can check out the progress of this project HERE. June, 2011: Annual Canada Goose Banding Round-up: Lots of messy fun and serious business. CLICK HERE for the details. 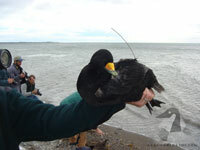 May, 2010: Satellite Transmitter Implants in Black Scoter (Melanitta americana): It was a pleasure to once again work alongside colleagues in New Brunswick, Canada in the capture and tagging of black scoter. This was the second year I was able to participate in this project which involves the Sea Duck Joint Venture (US Fish and Wildlife Service), US Geological Survey, and Canadian Wildlife Service. The goal is to better characterize scoter critical habitat use and site fidelity for breeding, molting, and wintering. We successfully implanted 20 birds in 2009 and whopping 48 in 2010 as well as banding, measuring, and sampling (blood and feather mercury and West Nile Virus detection) of many others. I flew into Boston, MA and had a great time driving up through Maine to New Brunswick. Springtime in Maine is absolutely stunning! The DNR officers and biologists in New Brunswick were very friendly and great in sharing their knowledge. There is strong French influence in this area and in some cases, when we worked on the Quebec side of the Bay of Chaleur, it was good that we had folks with us that new how to speak French better than me! April, 2010: Assisting USFWS in Bald Eagle Contaminants Study. It was a pleasure to volunteer 2 weeks in late April to help Phil Schempf of the US Fish and Wildlife Service in capturing and sampling free-living bald eagles throughout northern SE Alaska. We spent most of the two weeks on the MV Curlew moving to randomly selected capture sites. Captain Joe and the Curlew made the trip safe and enjoyable. We were also accompanied by Jim Johnson, a biolgist with USFWS (and my capture buddy for most of the time) and Rick Gray from BioDiversity Research Institute. In a nutshell, we would arrive on a site, put down 2 outboard skiffs, and go out to catch adult eagles. We collected one eagle at each site using herring that were specially prepared with monofilament nooses attached to a shock-absorbing rope and a floating cedar board. This system allowed us to safely capture 23 eagles. Once captured, the birds were measured, banded, and a feather and blood sample were taken for measuing mercury and lead and for performing genetics research. 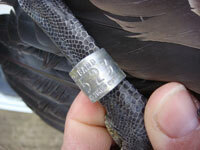 At 2 "bonanza" sites, we collected as many eagles as possible in one day. This study builds upon previous work performed in the late 1980s by Schempf. Stay tuned for results. Sea Duck Joint Venture funds Dr. Ford's Research! A grant was awarded for conducting perioperative care research with long-tailed ducks and black scoters. The research was carried out in cooperation with (and in-kind support of) the US Geological Survey's Patuxent Wildlife Research Center, Massachussets Audubon, and Canadian Wildlife Service. The goal is to learn more about the physiology of sea ducks undergoing satellite telemetry implantation and to refine surgery and care protocols. Phase 1 began at Nantucket Island in November, 2009 where 10 long-tailed ducks received satellite telemetry implants. Dr. Ford gathered blood samples, weights, and feather condition data and assisted the Mass Audubon and USGS in implanting radios. Phase 2 took place at Cape Cod in Spring of 2010. CLICK HERE TO LEARN MORE Update 5/3/11: Statistical analyses were completed in February, 2011 (thank you Quintana Baker!!). The resutls are quite interesting. I will present results at the Sea Duck Conference in Seward in September. Dr. Dan Varland is a raptor biologist who has been studying falcons and bald eagles on Washington's outer coast for over 16 years. His recently formed non-profit organization, Coastal Raptors, has a mission of conservation of birds of prey of the Pacific Coast through research and public outreach. Each year, dozens of volunteers help Dan survey the coast for raptors and capture falcons and eagles for banding and sampling. I personally find these trips enjoyable and I learn something every time I go! The Raptor Research Foundation (RRF) is an international scientific society whose primary goal is the accumulation and dissemination of scientific information about raptors. They publish an excellent scientific periodical, the Journal of Raptor Research. Dr. Julia Parrish started the Coastal Observation and Seabird Survey Team (COASST) in the 1990s as a means of collecting information about seabird species, numbers, and mortality rates on the Pacific Coast. The organization utilizes dozens of volunteers each year and has produced a field guide for identifying sea bird remains. The information they collect has proven valuable to Dr. Parrish's conservation efforts. The Sea Duck Joint Venture is a funding and conservation and research-guidance body composed of biologists from the US and Canada. This team determines conservation and research direction for most of the sea duck research conducted in North America. Hancock Foundation's Raptor Research News. This is a work in progress but nobody has done more to resurrect the hidden gems of the raptor scientific literature than David Hancock. 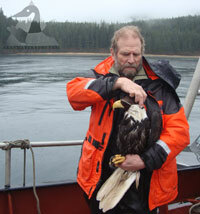 David is a raptor biologist from British Columbia, Canada, and has been studying bald eagles since the 1960s. This site is a promising addition to David's amazing passion for eagles and other raptors.